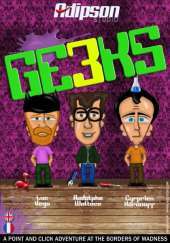 A post-nuclear point and click adventure in which you control three neurotic geeks who've escaped from a madhouse. Rodolphe Wallace, a 30-year-old unemployed inventor, finds himself plunged into a crazy and incredible adventure with his two friends: Cyprien Karanoff, a neurotic neat-freak; and Luc Vega, a bipolar, impulsive geek with only four seconds of active memory. To escape from the madhouse in which they've been locked up for a year, the three companions hide aboard a space shuttle that sends them into orbit around Earth, allowing them to avoid a nuclear apocalypse caused by Nathanael, a maniac who wanted to avenge his goat who died from human pollution. Five years later, the shuttle automatically returns to the partially irradiated Earth and deposits the three madmen in a desert near a post-nuclear town called Ragoon City. And then the adventure really begins. Go on an exciting adventure with crazy characters (references to French cult comedies unavoidable). Control three characters who have very different personalities: a pretentious, grumpy, unemployed inventor; a neurotic, germophobic chemist with tics; and a bipolar, impulsive geek with only four seconds of active memory. Solve balanced puzzles, neither too difficult nor too easy. Your notebook will help you keep track of your objectives. An easy-to-use interface lets you save the game anytime and configure the game options. Four chapters with at least six hours of gameplay, depending on your experience with point-and-click adventure games. Neat, cartoon-y graphics and a plot that will make you want to keep on playing. HD graphics and options for other resolutions. Play full screen or windowed. A humorous point-and-click adventure reminiscent of Day of the Tentacle and Monkey Island but with the French touch.